Lawrence is stepping in to help his friend Tom Rainey after Tom’s teammate injured his back in a training session. Beginning in New York, the pair will row unsupported for up to three months travelling 3,800 miles en route to Salcombe, Devon. 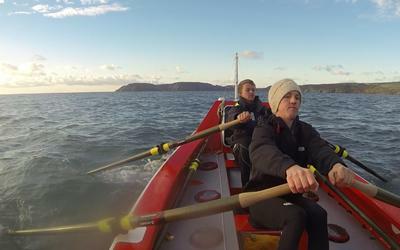 They aim to beat the world record as the youngest pair and in the fastest time. The current record was set in 1896 by Norwegians George Harbo and Frank Samuelsen, who made the journey in 55 days and 13 hours. The voyage has been attempted by 60 crews and completed by only 22. Following his studies in Ship Science and a lifelong affinity for the environment, Lawrence also hopes to bring awareness to the North Atlantic rubbish patch – an area of man-made debris stretching hundreds of miles – by recording its position. Visit their website Ocean Valour or their fundraising page to support their goal of raising £250,000. You can also follow their journey on Facebook or Twitter as they battle 40 foot waves, freezing waters and floating icebergs.